Learn from Davo: Slow Down, Stupid. @dirkthecow introduced us to What Davo Loves, a responsible-driving initiative for Queensland Transport, Australia. The site's put together like a generic profile page for a dude called Davo. 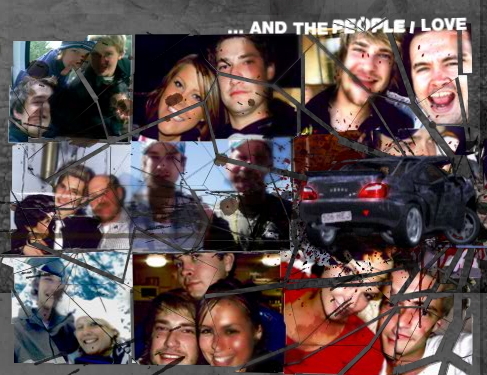 At right is a montage of people he loves, and at left is a video of him fondling his new car, lamely named "Rex." All frothy fun, right? That is, until the car careens out of the video frame and slams into his collage of friends, fracturing their faces like so much cheap glass. Nice integration of the breaking-the-fourth-wall gimmick, a popular one of late. Once the moment's sunk in, the site makes way for the straightforward campaign tagline: "Slow down, stupid." We love a little melodrama, but the effort isn't nearly as much fun as this Australian campaign in which speed-demons were playfully typecast as, uh, over-compensators. Thanks for your mention of What Davo Loves a little while back - it is much appreciated! I'm glad you enjoyed our attempt to do something a little different to spread the road safety message. Thanks to people like yourself spreading the word, we have successfully reached many road users with the Slow Down Stupid message. Cheers!